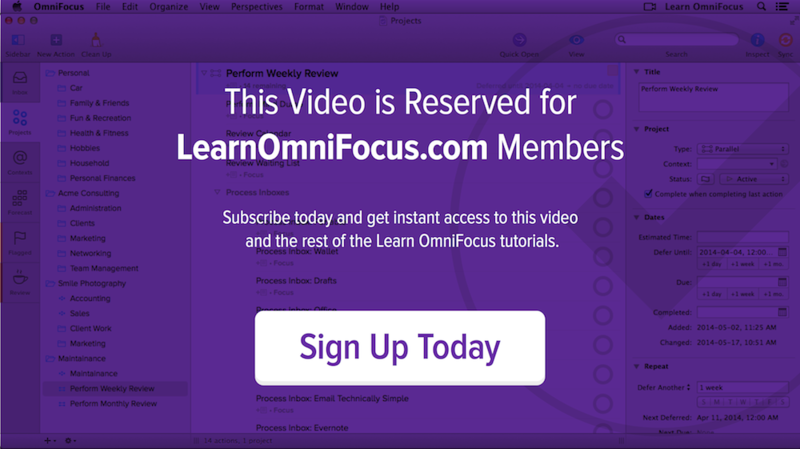 Learn how to use OmniFocus to manage everything from minute details to the big picture of your life and work. When used effectively, OmniFocus becomes a trusted ally that helps you navigate everything from your daily routine to the unexpected challenges that life throws your way. This session focuses on developing habits for using OmniFocus consistently, in a way that supports both the minute details and the big picture of your life and work. Keeping your system clean and consistent using weekly reviews. Keeping on top of goals and someday/maybe lists using monthly reviews. Charting a course for the upcoming year using annual reviews. Articulating short and long-term goals and aspirations using Evernote. Understanding the importance of having a solid foundation to build on. Getting things back on track if you get out of the habit of using OmniFocus regularly. It's recommended that you attend or watch a recording of the first three sessions in the series (Creating Structure in OmniFocus, Capturing & Processing Into OmniFocus and Stepping Into Action with OmniFocus) before participating in this session. A basic understanding of David Allen's Getting Things Done (GTD) is also an asset. Click the Download button to download the Evernote template that was referenced in the session. This template was inspired by a post on the Evernote blog written by Michael Hyatt: How Evernote can Help you Achieve Your Goals in 2015.